Bootfitter’s comments: Alpine boot performance at backcountry boot weight! The Hawx Ultra 130 was hugely popular upon launch last season, with customers loving not only the weight but also the precise 98mm last, progressive and consistent 130 flex, and lateral stability this boot offers. The Hawx Magna 130 is the top custom ski boot in our new wide-fit Hawx Magna series. This new series means for the first time you can get the legendary Hawx feel in a boot with a 102mm fit! It’s a massive step forward for wide fits, too: it’s the lightest boot in its class and packed with features for wider feet like the easy step-in zone and a wide tongue. It comes with Memory Fit for a fully personalized shell, cuff and liner. With Power Shift you can adjust your forward lean and alter your flex index - 10 flex points to suit you. The Gold liner features 3M™ Thinsulate™ Platinum Insulation to keep your feet warm and responsive. Top that off with colors matching our Redster XT series and you’ve got a great wide-fit boot – and most importantly, a great Hawx. Bootfitter’s Comments: The Hawx Magna 130 offers the rare combination of high performance for advanced/expert skiers in a generous shell shape, which can be custom moulded to accommodate the widest of feet. The AVANTI ID 120 is for top level skiers who seek high performance in a boot with more generous foot volume than traditional race level boots offer. With a 120 flex and 100 mm fit last, large, strong and aggressive skiers should take note. The Avanti 120 ID utilizes a 3D Power Frame architecture for improved handling and power transfer. The Avanti 120 ID also comes equipped with custom heat moldable Intuition ID innerboots that are super lightweight, warm and precise. 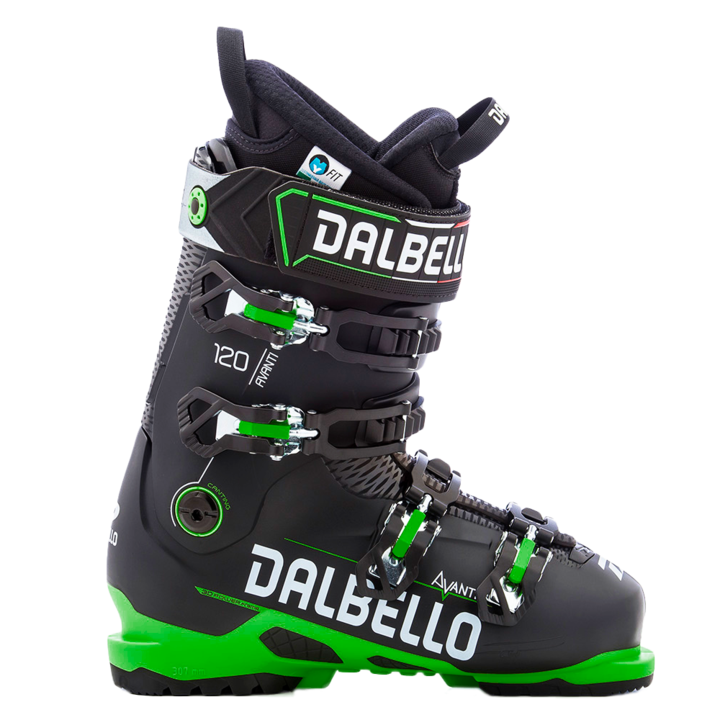 Bootfitter’s comments: An update of the popular Viper series, Dalbello’s Avanti 110 ID offers medium fit which suits a variety of foot shapes, and strong frontside performance for advanced skiers. The AVANTI 90 is for intermediate skiers who seek high performance in a boot with more generous foot volume than traditional race level boots offer. With a 90 flex and 100 mm fit last, all improving intermediates skiers should take note. The Avanti 90 utilizes a 3D Power Frame architecture for improved handling and power transfer. Bootfitter’s Comments: A great first pair of boots for someone looking to experience the performance and comfort of custom boots. Medium flex suits a wide range of ability levels, and the last shape is a proven winner. The Avanti AX 105 is for strong, technical, all mountain skiers seeking a classic, overlap, 4 buckle closure ski boot with slightly wider fitting characteristics that ofter found in traditional performance boots. Similar in construction to the 120 model, the Avanti AX 105 features a lighterweight DB HyLite tecnopolymer shell & cuff material construction. Featuring Contour 4 shell fit geomerty plus Drive & Control Technology, Blaze 100 provides a close rearfoot fit for performance and control while providing a spacious and comfortable toe box. TRUFIT ThermoLast Sport custom heat moldable innerboots. Bootfitter’s comments: A generous forefoot fit and a medium-firm flex in a traditional 4-buckle design offering great adjustability and support. Bootfitter’s comments: Serious frontside performance in a broader fitting package, the Vector Evo is a great option for serious skiers who want precision and response without compromising comfort. K2’s Spyne 130 is the flagship all-mountain performance powerhouse, fueled by the rivet-less Energy Interlock and reinforced by the Powerfuse Spyne. Offered in a 97mm(LV), 100mm, or 102mm(HV) last, your foot width no longer determines the performance level of your boots. The high end molded and lasted PrecisionFit INTUITION® liners, and the PowerCinch Strap produce the highest performing ski boot in the collection with a true 130 flex for all-mountain skiers. Bootfitter’s comments: Available in 3 different width fittings to accommodate a wide range of foot shapes, the Spyne 130 is a smooth-flexing, responsive boot from K2. Massively popular for technical all-mountain skiing. Emphasizing a balance between high-end performance and comfort, K2 Spyne 110 offers skiers a forgiving 110 flex on a high-performance platform. The LuxFit INTUITION® liner gives you a last fit with a customizable areas for those skiers who need it. The Spyne 110 offers all three last options at 97mm, 100mm and 102mm for a dialed fit without compromising any performance. Bootfitter’s comments: A softer-flexing Spyne boot for lighter or less aggressive skiers, the Spyne 110 is one of our most popular boots year upon year. The availability of three different width fittings make this a great match for almost any foot. The Speedmachine 130 Carbon delivers top of the line all mountain performance, regardless of what Mother Nature has in store for you. With its fully customizable Infrared Tri-Force shell and 3D cork fit liner design the Speedmachine delivers high performance and precision without sacrificing comfort. This boot was built to take on anything you or the mountain can throw at it. Powerful, comfortable and fun. Bootfitter’s comments: Back by popular demand! Nordica re-introduces the bestselling Speedmachine line for 2016/2017. The 130 Carbon is the flagship boot in the line. Carbon spine in the shell and cork in the liner ensure maximum heel hold and lateral response, but with a comfortable, roomier forefoot. Bootfitter's comments: The legendary Speedmachine 130 returns! The original struck an awesome blend of comfort and performance, and the cork liner and custom mouldable shell of the new Speedmachine 130 allow us to ramp the comfort up to the next level. Bootfitter’s comments: The re-incarnation of Nordica’s legendary Speedmachine all-mountain performance line. A medium forefoot fit, combined with a precise heel hold and cork liner give great response and all-day wearability. Bootfitter’s comments: The Cruise is always a hugely popular option year on year. As the name suggests, the shell shape is designed for comfort, with a roomy 104-mm last, but the 110 flex still offers great performance for larger or stronger skiers. Bootfitter’s comments: Our staff and customers are huge fans of Nordica’s Speedmachine range, and we’re delighted to be able to offer all the Speedmachine’s tech and performance in a wider fit option for the coming season. The 120 is the flagship Sportmachine model for advanced skiers looking for a high-performance boot with a relaxed forefoot fit. Bootfitter’s comments: The Sportmachine 100 is an exciting new addition to our range. Packed with the same technology as Nordica’s top of the line boots, the Sportmachine 100 offers all-day comfort in a package that will allow you to progess your skiing to the next level! Bootfitter's comments: Brand new from Fischer for 2016-2017, the RC Pro features a medium volume shell shape which can be vacuum moulded to give an optimum custom fit, and an ingenious liner featuring three different densities of material to give power and comfort where they are needed most. Bootfitter's comments: Utilising the all-new, 100mm lasted RC Pro shell, but in a versatile 110 flex, this is a great option for strong intermediate to advanced skiers seeking the comfort and performance of a vacuum-moulded shell. Bootfitter's comments: Head's Edge series has a long history of marrying high-performance features to a more relaxed, accessible fit. Brand new for this year, the Advant Edge 125 utilises a Hi-Top lower shell to offer awesome response and power transfer to your skis, while the Form-Fit shell allows us to custom mould the boot to your foot.